Vacuum cleaners only respond to estrogen? Here's a new one: An anti-sexism ad has been pulled for being, well, sexist. French TV station France 3 pulled its latest campaign after widespread criticism. The offending ad shows a home in a state of disarray—an oven smokes, children's toys are scattered, an unattended iron catches aflame, a dog is left whimpering—while ominous expect-sad-little-girl-ghost-here music plays. It closes on a shot of a woman's closet, with one pair of shoes clearly missing, as upbeat music plays and the answer to the question that's presumably your mind (i.e., "Where the hell are all the women?!") appears: "They are on France 3." The video, which was shared on Twitter, is accompanied by the following (translated) caption, which only makes it worse: "More different, more modern, more feminine! France 3 affirms its values through this new campaign honoring its female presenters!" Both video and the tweet are flanked by the lead copy for the work: "Most of our TV hosts are hostesses." The tweet reads, "The 'womens' campaign by @france3tv doesn't seem to me like a good way to valorize egalitarian professionals among TV presentors, dear @DelphineErnotte." Burn. Ernotte, the president of France Télévisions, which owns France 3, is, curiously, also a woman. 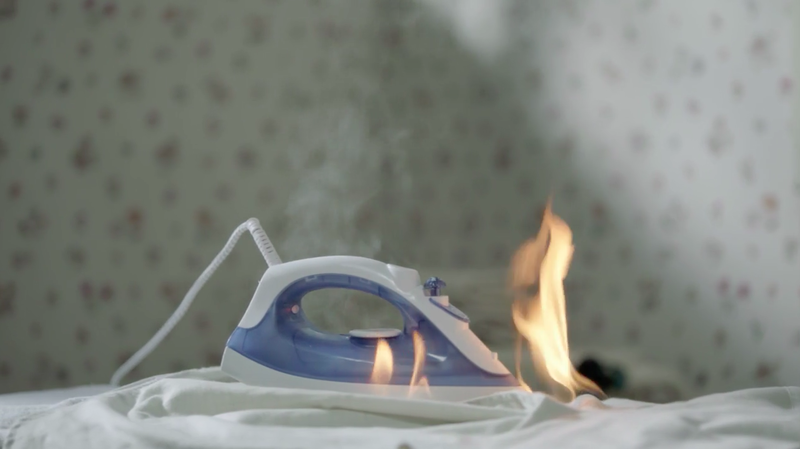 (Maybe her husband complains a lot about the scorched ironing?) And the irony wasn't lost elsewhere on Twitter, either.